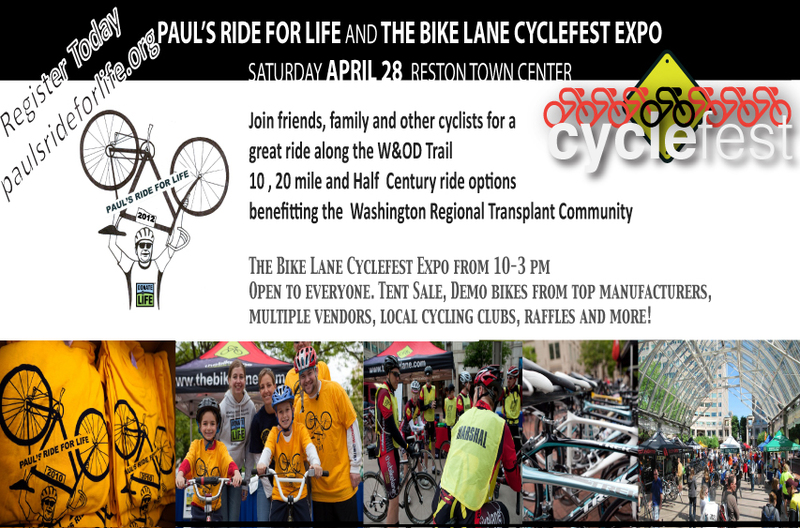 Join us this Saturday for Paul’s Ride for Life and Cyclefest at the Reston Town Center pavilion! Paul’s Ride for Life kicks off at 8 am for a 10, 20, or 50 mile ride along the beautiful W&OD. Proceeds from the ride benefit the Washington Regional Transplant Community. The Community Canteen will be welcoming back riders with free coffee and pastries. Park your bike in our free Bike Valet (courtesy of EX2 Adventures) and stick around for The Bike Lane’s Cyclefest Expo. Ride some of the top bikes in the world! Trek and Felt will have their demo trucks filled with road, mountain and tri bikes! The Bike Lane will be bringing our Niner mountain bike demos for you to take out for a spin on the trail. Bring the kids and their bikes out for the Bike Safety Rodeo sponsored by Trails for Youth! The rodeo starts at Noon until 2:00 pm. Also, we will have live performances from TUNNEL– an up and coming Prog/Alternative/Rock band based in the Washington, DC. Check out the expo from 10-3 pm we will have vendors and local clubs including Saris, Camel Bak, Yakima, MORE, Team Z, Team in Training, Evolution Cycling, MS Ride, Tour de Cure, Reston Bike Club, Positively Chiropractic, FABB, Wilderness Voyagers, Pedal Pushers and more. Enter to win a Trek 7.3 FX and other raffles! See you Saturday. Cyclefest 2011, a set on Flickr. The Bike Lane’s 5th annual Cyclefest was the biggest one yet! It was a gorgeous day at the Reston Town Center. The Bike Lane hosted over 25 booths for local cycling clubs, organizations, and vendors such as Trek, Yakima, Camelbak, Mavic, Felt and more. Paul’s Ride for Life kicked off the day with over 300 riders. Trails for Youth hosted a kids bike safety rodeo and BMX shows kept everyone entertained. It was a great day and we look forward to going big next year. A big thank you to Paul’s Ride for Life and our vendors: Team Z, MS Ride, Tour de Cure, Positively Chiropractic, Team in Training, the Reston Bike Club, Amyazing Youth Tri, Fairfax County, JCC, Mon Ami and Community Canteen, Wilderness Voyageurs, Evolution Cycling Team, Pedal Pushers Club, FABB, NVRPA, MORE, Trails for Youth, Washington Regional Transplant Community, Trek, Felt, Camelbak, and Mavic.